Last week, during Coastal Scent's Cyber Monday sale, I placed a small order. 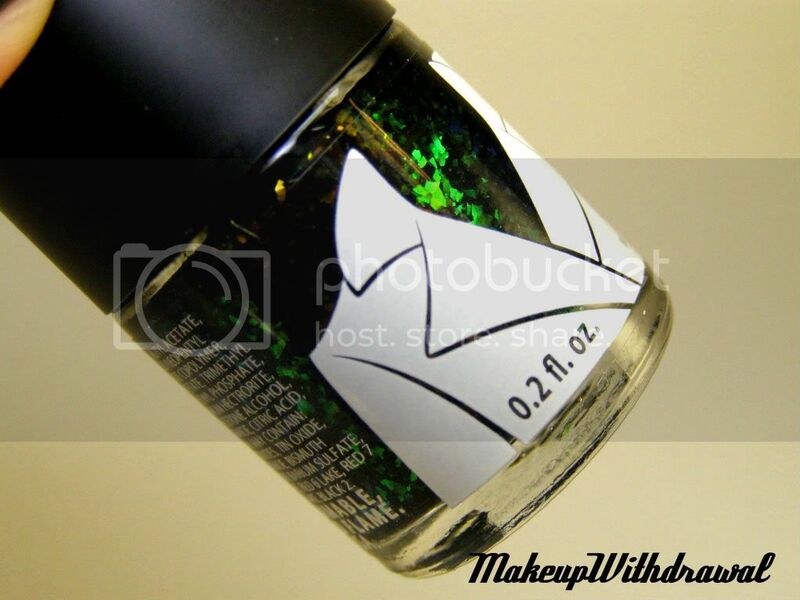 The first thing I intended on buying was this flake polish that I had noticed in their new COAT polish line. I had to take some quick pictures as soon as I got it. 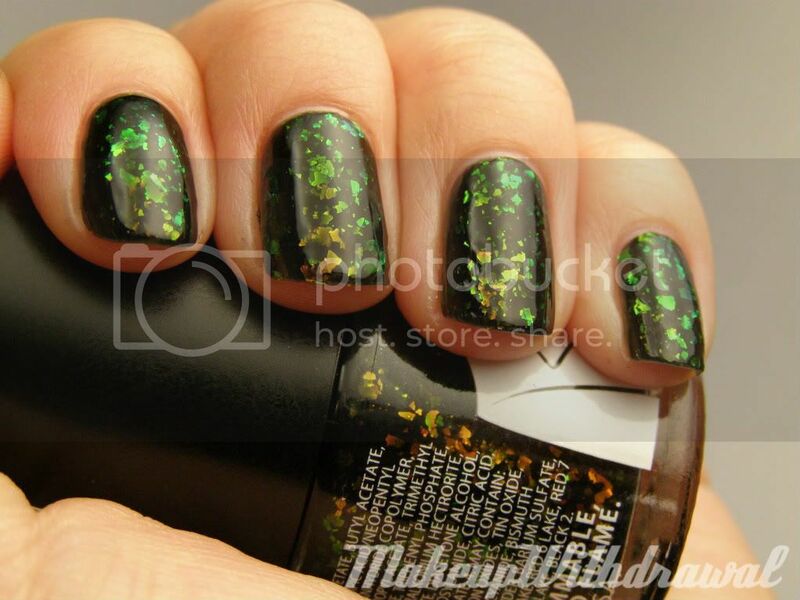 This is Cosmic, a black base with green flakes that wink yellow-green and a tinge of gold-yellow. These polishes are $3.95 regularly, but I got it at $2 because of the sale. They're quite small at 0.2oz, and thought I found the bottle very cute with the coat design, I despised the short handled brush. It was difficult to see around. These flakes are chunkier than most others, such as Sally Hansen Hidden Treasure, the *new* NYX Ave polishes, or Essie Shine of the Times. They don't lie as flat on the nail, and I felt like I needed two coats of top coat to really gloss it over. Since I'm a good blogger (har, har) I did a quick comparison shot. The middle and pinky nails are just three coats of Cosmic. As you can see, Hidden Treasure is more dense, has smaller particles and is warmer in its range of colors. 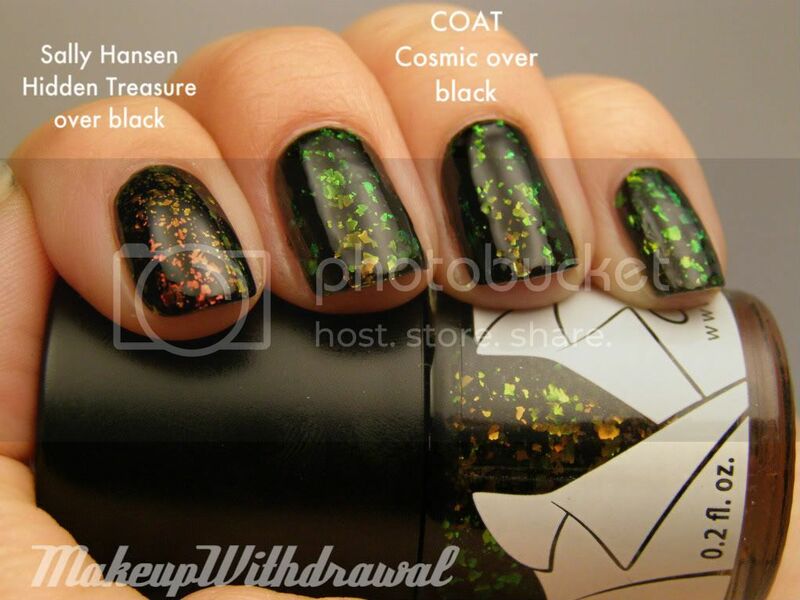 Also, one coat of COAT Cosmic looks pretty much the same as three coats of Cosmic. Perhaps you don't get quite the same depth... but I think it's close enough. Waste not polish, right? P.S. - I sincerely apologize that I haven't finished tallying my latest contest. There were many more entries than I expected and to make sure that I am as fair as I can be- I am dutifully checking each entry. Thanks for being patient!